Best known for playing characters who are intelligent, unsympathetic, aggressive, humorless, ruthless and totally evil, Lee was born in London, England, to an Italian contessa and a colonel in the King’s Royal Rifle Corps. First exposed to theater in school, the interest became so deeply routed that after receiving a scholarship to enter Eton and Welling College, he became a classical Greek and Latin scholar. Throughout his years of study, Lee was in the top ranking at squash, racquets and fencing, and was equally at home at cricket, rugby, football and hockey. Following school, Lee worked as an office boy and messenger in the city of London. When WW2 hit, Lee entered the army and served five years in the Royal Air Force and Special Forces (where he learned several languages including French, Italian and German). He was decorated for distinguished service and held the rank of Flight Lieutenant. After the war, Lee tried acting but his height (6’4”) impeded his career. For ten years his career consisted mostly of bit parts and television work. He even worked at a London department store for a time in the early 1950s. Lee’s big break in film came in 1957 when he played the monster in a Hammer Films’ remake called Curse of Frankenstein. The film was successful on both sides of the Atlantic and helped revive interest in horror films. 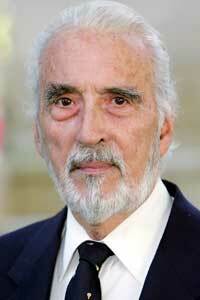 He followed the success with starring roles in many more horror films, making him one of the icons of that industry. With his imposing presence, he has played numerous villainous roles including the Frankenstein Monster, Count Dracula, Fu Manchu, the Mummy, Dr. Jekyll and Mr. Hyde. Throughout his many years in front of the camera, Lee has portrayed Sherlock Holmes and his brother Mycroft, made powerful performances as King Charles the First of England and King Louis the Sixteenth of France, and he has appeared in more sword fights in front of the camera than probably any other actor in history. He performed all of his own stunts and is an honorary member of three Stuntmen’s Unions. Lee has also won numerous awards for his contribution to cinema from the United States, France, Germany, Spain, Italy and Great Britain. In 2001, Lee was made a Commander of the Order of the British Empire by Queen Elizabeth II. Married to Danish model and painter Gitte Kroencke since 1961, the two share a daughter, Christina. Presently living in the United Kingdom, Lee’s other interests include golf, traveling and opera. He is also a published author of four books including his autobiography, Tall, Dark and Gruesome and The Films of Christopher Lee.